It's another My Creative Time "Monday Madness... Imagine That" design team post! Today Emma has asked us to make a shaped card using our Imagines. I decided to cache a music pattern from the Vintage Papers cartridge to use with the heart shaped card, cut at 4.2", from All Wrapped Up. 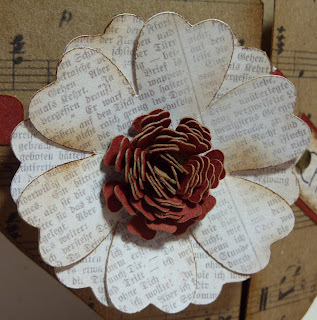 I used The Paper Company's kraft cardstock to give it a different look. For the little bands, I printed and cut them in red, again using the kraft cardstock. If you have All Wrapped Up, you'll see that I only used the main layer and the little bands. I didn't need the other layers for this project. Click here to see the video I made on how to cache a pattern with your Imagine. For the flower, I wanted to use the text pattern from Vintage Papers, but I didn't want it to be the teeny size the Imagine would make it to scale with the flowers. Instead, I cut a 7" square with the text, and then I used that to cut my flower parts at 2.5". 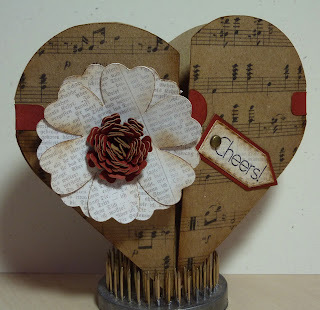 The larger petals are the Heart2 cut on page 14 of the Flower Shoppe Cricut cartridge. For the center of the flower, I printed a 4" square on kraft cardstock, using the same red as before. I then used this to cut Heart1 from page 14, again at 2.5". 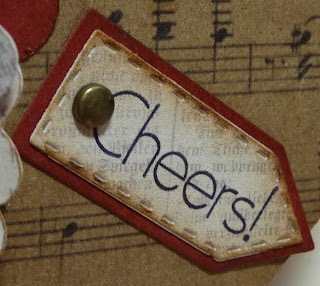 Emma asked me to showcase her Classy & Fabulous stamp set today, and I was thrilled to see that the "Cheers!" sentiment fits perfectly into her Teeny Tag Greetings dies. I cut the layers out of scraps from my previous cuts, to make them match the rest of the card. Then I just used a little brad to attach it directly to the card. I just had to show you that even the back of this card looks cute! Be sure to stop by My Creative Time to see more fun Imagine projects by Emma and the design team! Beautiful card! Love the music pattern! Beautiful card, really love it !!! Lovely card! The kraft paper really adds to the vintage feel. Katie..this is sooo pretty! Very nice job...love the front! Oh my this is just BEAUTIFUL! I LOVE what you did with the Imagine! All the details with the cuts and prints ~ are just CLEVER! You utilize that Imagine so PERFECTLY! Thank You for always explainging how you do things! I am ALWAYS in awe! 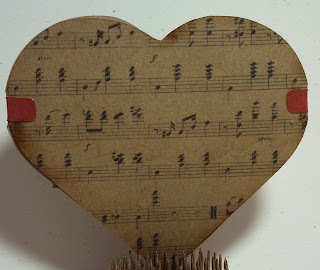 I have to go look at that heart now ~ another fabulous idea! Awesome card! I am still learning how to use my Imagine. I just got it for black Friday! Thanks for the video!